Keach sporting the 'Big Ern McCracken' comb-over throughout. It's a tough look to pull off, but Stacy has it down to a science. Ah, the cinema of the Seventies. When it came to dramas, the camera was pointed squarely at the dark, seamy underbelly of human existence in the early part of the decade. Come wallow in it! Become the head of the Corleone crime family! Take a canoe trip in the backwaters of Georgia! Spend a little ECT time with Nurse Ratched! The grittier the better! Make 'em squirm in their seats! I'm all for realism in theater. I can handle (and sometimes invite) the opportunity to ponder the darker side of human existence. It's a healthy way to ground yourself. And at the very least, you can look at the flawed humanity on the screen and say, "At least I'm not THAT guy!" Well, while watching Fat City, those words were uttered more than once. It was practically the mantra for the movie! Billy Tully (Keach) is down on his luck. He's an Ex-everything. Ex-boxer. Ex-husband. Ex-sober person. He had his big shot and he failed. So he decided to crawl into a bottle instead of the whole "pick yourself up by the bootstraps" approach. His wife has left him, but we get the feeling that this is an effect rather than a cause of the alcoholism. On a particularly inspired morning of semi-clarity, Billy decides to head down to the gym for a workout. He runs into a young man named Ernie (Bridges), who manages to show promise during an incredibly short sparring session (Tully pulls a side muscle about 1 minute in). This proves to be enough for Tully to recommend Ernie to his old boxing trainer, Ruben (played by Nicholas Colasanto, "Coach" from Cheers!). And so we move forward from there. Well, "forward" might be too strong a word. We kind of move in a zig-zag motion, staggering along with our 2 protagonists. 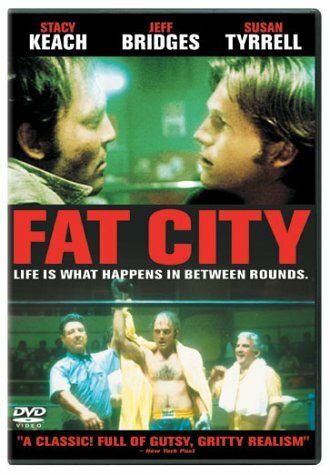 The tagline for Fat City is "Life Is What Happens In Between Rounds". Unfortunately, life isn't all that exciting. Following Billy and Ernie is actually kind of uneventful, boring even. Billy picks up the odd days work picking fruit, just enough to pay his bar tab. Ernie manages to deflower his high school girlfriend in between fights. Billy spends an interminable amount of time getting soused with his new, shrill rummy of a semi-girlfriend, Oma (Tyrrell). Ernie ends up getting his girl pregnate, so he quits school and gets a job (picking fruit with Billy). I get the feeling that the filmmaker's were trying to go for a feeling of gritty hopelessness in their setting and pacing, but I have to say that they failed. Billy and Ernie aren’t so much hopeless as they are aimless. They float in and out of the gym. They have people who care about them or are, at the very least, trying to help them out. But they choose to alienate themselves. Keach is the best part of this movie. First and foremost, he has the physical attributes of a fighter. His face and demeanor when walking around in the non-boxing settings lets people know that this is a man that has no compunction about scratching out a living getting poked in the chops. It's nearly impossible to root for someone as self-defeating and uninspired as Billy Tully is, but Keach's performance has you at least caring about his well being. It's not a hokie, "lovable loser" persona. This is a man that's dug himself a hole and occassionally makes an attempt at getting out. Any sympathy for Tully finds it's biggest road block in Tully's choice of company. He meets his eventual girlfriend Oma while out on a bender, and she tags along for a good portion of the movie. Blurting out non-sensical rants at Tully, always in her beat up cocktail dress of a uniform, Susan Tyrrell plays drunk VERY well. But not a fun drunk. The kind of drunk that you get up from your seat and move away from in a bar. We don't have that choice and it kind of made me resent Tully for choosing such an unpleasant booze-bag to hang around with. But I may be alone in this assessment, as the Academy saw Tyrrell's performance Oscar nomination-worthy (she lost in 1973 to Eileen Heckart). The rest of the cast is ineffective at best. Bridges is little more than a mumbling piece of meat in this performance. His character doesn't so much "live" life as much as "plow through it". I should box? OK. Girlfriend's pregnant? OK. Get a job? OK. He garners no sympathy, nor does he deserve any. I think this was a miscast, as Bridges has a natural charisma that he really had to turn off for this role. I think the Ernie character was suppossed to be the "lovable loser", but Bridges is so muted that he comes of as just dim and easily led. The boxing trainer Reuben, played by Colasanto was another non-entity. He almost seemed to be here for some form of comic relief, giving out unheralded boxing advice and always seeming somewhat upbeat. Maybe it wasn't a matter of Colasanto being ineffective, but that anyone would seem ineffective in the face of such sadsacks. I'm really torn here. It seems like the actors in this movie were really trying their hardest to bring a sense of realism to the fighting. In some scenes, it looked like Keach and Bridges were willing to actually take and give a little bit of real punishment in order to give a credible performance. And I applauded the absence of the audible "slap" that accompanies so many punches in boxing movies. But in this case, I think they could have done with more "stage punches". Despite their valiant efforts, Keach, Bridges, and the rest of the boxers weren't able to "let their punches go" in a convincing manner. The attempt to catch candid boxing action caught these actors pulling their punches more often than not. This is a rare case where I would have suggested a little more choreographed action. As I said above, Keach has the look of a real boxer. He has a "tough" face, for lack of a better word. And his build is perfect for the super middleweight that he's playing. Bridges has a less sculpted look, which actually worked for his baby-faced portrayal of someone who's just getting into the game. And I have to say that the post fight trauma special effects were top notch in this movie. Al Silvani went on to great work in some of the "Rocky" movies and even "Raging Bull", he wasn't very effective in his first attempt at fight choreography. And it really took away from the movie. I'm stymied by the accolades for Susan Tyrrell's perfomance. I thought her character was the embodiment of what was wrong with this drama. She was unsympathic, boring, and lacking in dramatic possibility. Life might be what happens between the rounds, but some people's lives aren't worth filming.